Who says your glazed ham days needed to be over when you joined keto? This sticky-sweet Butter Bourbon Glazed Keto Ham will have your taste buds jumping for joy. Notes: A spiral-cut ham won’t work for this exact recipe, although you can pour the glaze over anything you like! For the sweetener, I used Torani’s Brown Sugar Cinnamon syrup, but you could use Lakanto’s Monkfruit Maple Syrup (save 20% with code WICKEDSTUFFED). Stick the whole cloves into the diamonds. Place your ham into a shallow roasting pan. In a small saucepan, combine the remaining ingredients and heat until smooth. Pour the mixture all over the ham. Bake for about 2 hours basting frequently, then enjoy! If you’re looking for something to accompany your Keto Ham with a Sweet Butter Bourbon Glaze, try my Wicked Good Whipped Cauliflower recipe next. 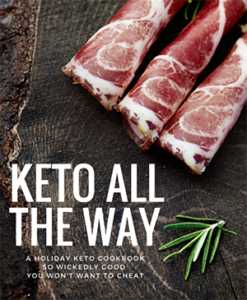 Both recipes come from my holiday cookbook, Keto All The Way. 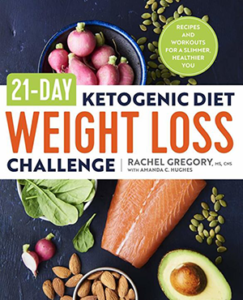 https://amzn.to/2FPsBTGWho says your glazed ham days needed to be over when you joined keto? This sticky-sweet Butter Bourbon Glazed Keto Ham will have your taste buds jumping for joy. Forgive me for being naive, but why won’t it work with a spiral cut ham? I already bought mine, my niece won’t eat ham unless it’s slathered in sugar, and I don’t want to make it inedible for me once everyone leaves after the holiday. It’s hard to find a spiral ham that isn’t already all honey’d up but you can certainly use the glaze on anything, it just won’t look the same because the spiral ham is already scored so you may have to tweak the first part. The glaze is good for anything but spiral hams tend to be bigger so you would likely be doubling the recipe. That makes sense. The ones I usually buy have the glaze separate so I warm it and put it in a gravy boat for anyone who insists on having sweet ham. Now I can enjoy it too! Thank you.